After the holidays, as you’re hustling to get back into the swing of your normal, everyday life, you might feel a wee bit guilty that you’re not spending as much quality time with your pup as you’d like. And those puppy dog eyes she’s giving you aren’t making it any easier, are they? But you know what? Guilt really doesn’t do you or your pet any good, so instead of beating yourself up about not spending the whole day at the dog park, follow some simple tips. By adding just a couple of these activities into your routine, you could have a much happier dog in 2015 — and we have a feeling that might make you smile, too. 1. Give her great self-entertainment options like food puzzles. Most of us are guilty of giving our pets extra treats to compensate for not spending enough time with them, but we all know that’s not a great plan. 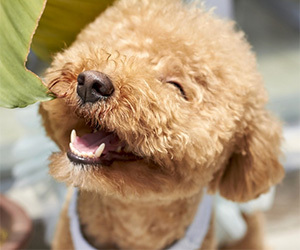 Giving your pup new and interesting ways to get her daily nutrition is a far healthier option. Behaviorist Dr. Wailani Sung is a big proponent of food puzzles, which are toys created to hide food so your pet has to work to find it. “Puzzle toys/interactive toys are great in keeping our dogs mentally stimulated,” she explains. “It is fun for owners to watch their dogs try to figure out how to get the food out, and [these toys] give dogs a great outlet for their energy, both physically and mentally,” Dr. Sung says. She compares the extra mental effort food puzzles take to the extra effort and focus it would take for her to read a textbook rather than a trashy novel. Having to think about how to get his food — and physically work at it — means your dog expends more energy. 2. Organize outings to see other dogs or people. Of course, if your dog isn’t interested in his fellow pups, you can also take him out to an establishment designed for humans but that is dog friendly, like a coffee shop with a patio. Get creative — maybe you can take your laptop and get some work done while he takes in the sights (and smells), or perhaps you can catch up with your friends somewhere new that is conducive to bringing your canine companion along. You probably feel better about your day when you have some semblance of an idea about what’s going to happen, right? When it comes to rest and activity, that’s something your dog enjoys, too. So, making a point to always give your dog a walk or play session — even a short one — at the same time of day isn’t just good motivation for you; it also can be beneficial to her state of mind. 4. Teach her a new trick. When you use positive reinforcement to teach a dog a new trick, it becomes more like a game than anything else. And, yes, that’s even true for the stubborn ones. The best thing about this is that you don’t need to dedicate an hour every day to training — five minutes here and 10 minutes there of focused attention is all you really need. And it might be all she can handle at one time anyway. Of course, the bonus to this one is that you’ll be able to track her progress as you go along. If you’re coming up short on tricks to teach your pooch, follow along with Mikkel Becker’s training videos. You and your dog will both be likely to learn something there. 5. Make daily grooming more of a bonding opportunity than a chore. Do you dread brushing your dog almost as much as she dreads you trying to brush her teeth? Maybe 2015 is the year for you to reset your approach. Sure, you probably look at it as something you just need to get done, but what if your routine became a five-minute ritual you both looked forward to? This might mean you need to start from scratch, so let her get comfortable with the brush or any other tools you need to use. Give her plenty of positive reinforcement and move slowly, making sure to give her love, praise, belly rubs and treats as you go. Once you both learn to relax a bit, it might truly become a process you enjoy.